With this note on 11 April 2014 I launch one of my forthcoming book projects: The Dark International. The League against Imperialism, Anti-Colonialism, and International Communism, 1925 – 1937. The major reason for why is that I want to write, revise, and publish a transnational history on my doctoral thesis on the sympathizing organization the League against Imperialism (1927-37). The book will be divided in three thematic parts: Part I will introduce a general survey over the relationship between anti-colonialism and communism as radical political movements during the interwar years. The chronology will abide to a spatial principle, i.e. begin in Versailles 1919, initiated in Brussels, developed and reaching a critical point in Berlin, only to end in Paris and London. Part II will focus on the internal aspects of the League against Imperialism and the relations to its main beneficiary, the Communist International. This part will rely extensively on my doctoral disseration “We Are Neither Visionaries Nor Utopian Dreamers”. Willi Münzenberg, the League against Imperialism, and the Comintern, 1925-1933 (Åbo Akademi University, 2013). Part III shall explore and analyze the transnational political and cultural exchanges of the League against Imperialism. This calls for examining the national sections of the LAI, and, the nature and political discourse of the LAI’s propaganda. This part will also include an examination of the critique introduced and vigorously maintained by the European socialist movement against the LAI, a question that addresses the difficulties of the socialist movement to approach and take a stand on the colonial question during the interwar years. Aside from these three themes, the book will include an introduction and discussion on the very idea of “the Dark International”, a conclusive discussion, and a dramatis personae. Based on documents collected in archives in Moscow, Berlin, Amsterdam, Paris, London and Stockholm, the general aim of the book is to produce an extensive and thorough history that will cover every aspect of the League against Imperialism. In 1946, an unknown writer remembered and described the Hungarian Laszlo Dobos as “a smooth operator”, a person that had been active under the name of Louis Gibarti (1895-1967), and was intimately connected to Willi Münzenberg‘s activities. I will not here go further into detail about Gibarti/Dobos life and career in the international communist movement during the interwar years. However, the definition of Gibarti as “a smooth operator” aptly describes his life and the ambigous traces left behind in the Comintern Archive in Moscow, traces that leave more questions than answers. While some of the active individuals in the Comintern left a trail of documents, compiled and categorized in personal files, Gibarti’s personal file consists only of half a page (see below), which, in all of its scarceness, give no substantial evidence or clues about his actual role or contributions in various communist movements or activities during the 1920s-30s. Still, Gibarti is a fascinating character in the history of international communism, a person that played a part in shaping the outcome of the League against Imperialism and the Anti-war movement in 1932 (the Amsterdam Congress in August, 1932) to mention a few examples. In 1941, the political police in Madrid arrested Gibarti “while trying to cross illegally Spain”, whereupon he spent 27 months in Spanish prisons and camps. 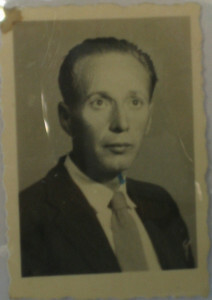 After the Second World War, Gibarti held a position in the UNESCO, later suspected of being an informant for the FBI in connection with the communist spectre beginning to haunt the USA as the Cold War made its entrance. 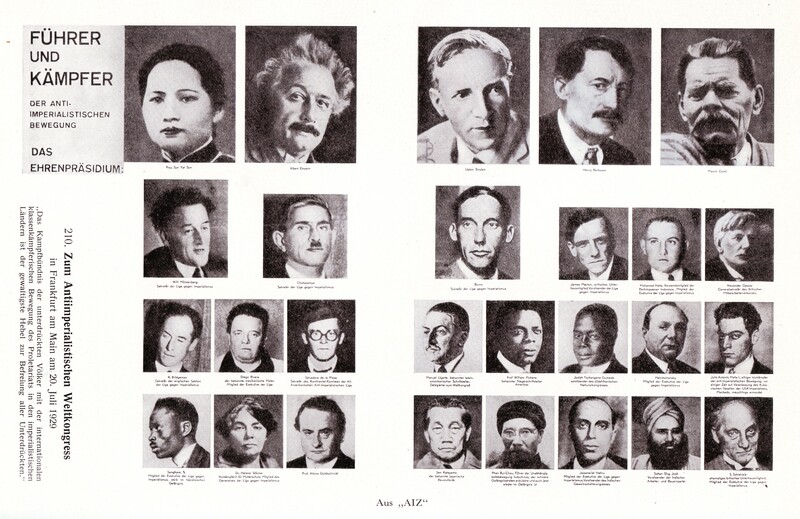 In 1955, Gibarti re-established some of the contacts from the 1920s as he interviewed the Indian Prime Minister Jawaharlal Nehru in the French paper Le Monde diplomatique in relation to the Afro-Asian Conference in Bandung 1955. 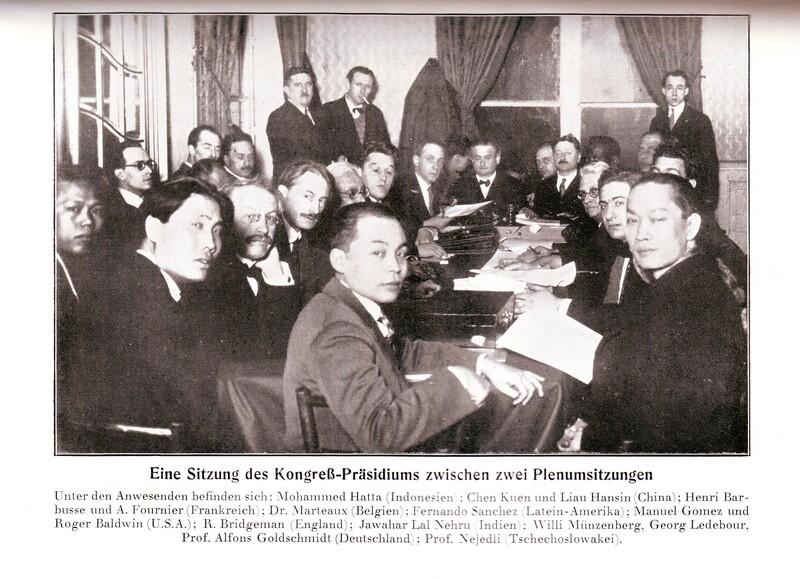 Thus, this is one of several historical threads which link together the Bandung Conference in 1955 with the “First International Congress Against Colonialism and Imperialism” in Brussels 1927. Luis Gibarti, geb. 26.4.95. Ungarn. Politisch organ. Seit 1913 Jug. 1919 ung. KP. KPD seit Febr.29 (?) Arbeitete im internationalen Auftrag für die IAH, war in Amerika usw. Vor Eintritt der Hitlerdiktatur war G. Instrukteur der Telefunkenzelle. April 33 verließ er Deutschland auf Anweisung des Gen. Mü [Münzenberg]. Er meldete sich nur bei seiner Zelle ab, da er die UBL nicht erreichen konnte. War dann in Paris Sekr. d. Welthilfskomitees, und reiste in dessen Auftrag auch andere Staaten. On 10 February 1927, the “First International Congress against Imperialism and Colonialism” in Brussels marked the establishment of the anti-imperialist organisation, the League against Imperialism and for National Independence (LAI, 1927-37). The complex preparations for the congress were though initiated already in 1925 by Willi Münzenberg, a German communist and General Secretary of the communist mass organisation, Internationale Arbeiterhilfe (IAH, 1921-35), together with the Communist International (Comintern, 1919-43). Berlin was the centre for the LAI and its International Secretariat (1927-33), a city serving the intentions of the communists to find colonial émigré activists in the Weimar capital, acting as representatives for the anti-colonial movement in Europe after the Great War. With the ascendancy to power of the Nazi Party (NSDAP) on 30 January 1933, the LAI reached an abrupt, but nonetheless, expected end in Berlin. This book, based on Petersson’s doctoral dissertation, examines the role, purpose and functions of a sympathising organization (LAI): to act as an intermediary for the Comintern to the colonies. The analysis evaluates the structure and activities of the LAI, and by doing so, establish a complex understanding on one of the most influential communist organisations during the interwar period, which, despite its short existence, assumed a nostalgic reference and historical bond for anti-colonial movements during the transition from colonialism to post-colonialism after the Second World War, e.g. the Afro-Asian Conference in Bandung, Indonesia in 1955. 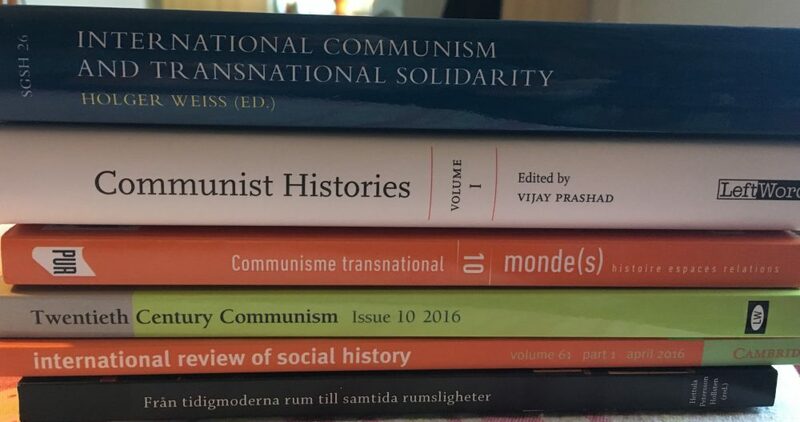 Fredrik Petersson’s study, based on archives in Moscow, Berlin, Amsterdam, London, and Stockholm, uncovers why the Comintern established and supported the LAI and its anti-imperialist agenda, disclosing a complicated undertaking, characterised by conflict and the internal struggle for power, involving structural constraints and individual ambitions defined by communist ideology and strategy. The war and terror in Syria has taken on horrific proportions, yet, and as sad as this may sound, this is nothing new to the country or region in itself. In 1925, the French mandate forces, which, in other words, was how the colonial powers rephrased their control over the colonies after the establishment of the League of Nations and with the Versailles Peace Treaty in 1919, brutally suppressed a tribal uprising in Syria. Similar to the situation in Syria today, numerous people (men, women and children) were affected by the military measures to bring order to the country, yet this time it was the French military. However, the consequence of these measures provoked a strong reaction in Europe, and became part of the nucleus that later would constitute the formation of the League against Imperialism (1927-37), a leading petitioner and protester against colonialism and imperialism during the interwar years. 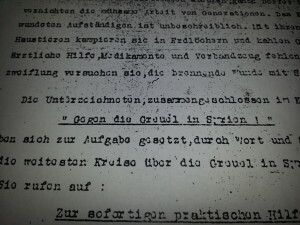 The reactions on the disastrous situation and violence in Syria was concentrated in the committee “Against the Cruelties in Syria” (in German: Gegen die Greuel in Syria), the creation of the prominent German communist Willi Münzenberg (1889-1940) and the communist mass organization the Internationale Arbeiterhilfe (1921-35), who was (and still is) described and perceived as the leading persona during the interwar years in designing and shaping the propaganda campaigns of the communist movement, ideas which from time to time evolved into transnational enterprises. Yet the history of the “Against the Cruelties in Syria” committee is a short one. 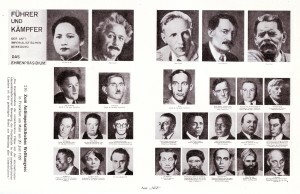 The committee was initiated in December 1925, and dissolved in the beginning of 1926, fused with the anti-colonial organisation the League against Colonial Oppression (LACO; in German: Liga gegen koloniale Unterdrückung), which later acted as the official organiser of the “First International Congress against Colonialism and Imperialism” in Brussels at Palais d’Egmont on 10-14 February, 1927. 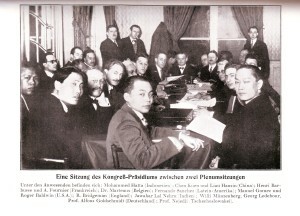 The congress also witnessed the establishment of the League against Imperialism. The peculiar idea behind the Against the Cruelties in Syria committee was to get leftwing intellectuals and leading politicans in the European socialist movement to support the political message. Prominent people involved in the committee were, for example, Ernst Toller, Henri Guilbeaux, Weiland Herzfelde (brother to artist John Heartfield), George Ledebour. The leading principle for the committee was to raise awareness by signing petitions, publish declarations of protests, and arrange public demonstrations. Hence, this is pretty much the blueprint of twentieth century political activism, however, activism these days rather transmitted through the dynamics of social media. Yet at this point, it was a question of acting and interacting for the sole reason of spurring some kind of reaction on what was happening outside of Europe’s borders and its power structures, particularly to illustrate and inform about dramas enacted in colonial and semi-colonial countries. This so-called Syria committee promised to, which it to some degree managed to do, raise awareness and material relief in Europe on the drastic and gruesome effects of the mandate system, i.e. the continuance of colonialism after the “Great War“. What now is happening in Syria deserves a similar reaction from prominent individuals in Europe and beyond, or can just one simply say that there already exists an abundance of political and moral support that seeks a solution to the onslaught? The clock is ticking and so does the lives of ordinary men, women and children, caught in the maelstrom of violence due to the power struggle of the Syrian regime and the national liberation movement.